How much bleach is used with how much Beast Wash to clean an awning? It depends on how dirty your awning is. Typically a 4 to 1 ratio of Beast Wash to Bleach diluted with water works. 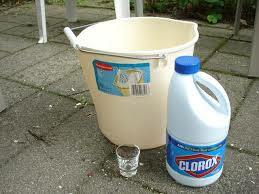 I usually use 2 cups of Beast Wash with ½ cup of Bleach diluted with 1 to 2 gallons of water. Apply that with a brush, making sure NOT to get the solution on your sidewalls. Once applied roll up the awning and let sit for 15 to 30 minutes then rinse with water. If the awning is heavily stained repeat the process. Hope this helps!